Frans Steyn believes he will not feature in South Africa's Rugby World Cup squad this year and that he will play Test rugby again, saying he has "accepted that my days in a Springbok jersey were finally behind me". Steyn last played for South Africa in the match against a World XV at Newlands last June, the playmaker subsequently withdrawing himself from the squad because of a contractual dispute with the South African Rugby Union. 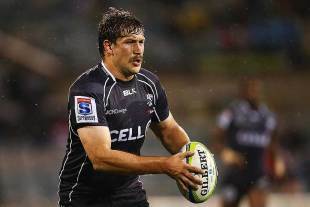 Steyn then accepted a contracted to play with Toshiba Brave Lupus in the Japanese Top League, from where he has returned only recently to play for the Sharks in Super Rugby. Steyn was yellow-carded in his first match back for the Sharks, the defeat by the Stormers in round four, but he scored the opening try of the round-five victory over the Cheetahs in Bloemfontein. "My only focus is to be included in the Sharks team, play my part and be proud of the team's performances," Steyn said in an interview with Rapport, and Afrikaans-language Sunday newspaper in South Africa. Steyn, who has played 53 Tests for South Africa, including 11 Rugby World Cup matches, remains the youngest player to have won the global showpiece, in 2007, apparently holds few hopes of heading to England in September and October. "It's always a privilege to play for the Boks. However, when I moved to Japan I accepted that my days in a Springbok jersey were finally behind me. I have made ​​peace with it." Rapport had previously reported that Steyn's return to South Africa indicated his desire to play for the Springboks at the Rugby World Cup in England and Wales, with the player's agent, Gerrie Swart, quoted in December as saying the player had wanted only to take a temporary break from international rugby. Steyn noted in the latest Rapport interview, however, that "players like Damian de Allende and Jan Serfontein have also put their hands up high and proved they are world-class". "If Jean de Villiers recovers [from a knee injury], which I hope and pray happens, he chooses himself."